Herodotus was a famous Greek historian of the ancient times who lived around 500 BC and he was born in Asia Minor in the Persian Empire. He was referred to as the Father of History as he wrote a lot of history and tales of the unknown from lands far off. One of his most intriguing account was the one of the legendary Gold digging ants, as big as Foxes, which lived in the high Himalayas in a land he called Dardae (In Sanskrit is was called Dardesa, the Land of the Dards). Those who have studied history, especially accounts of history written by ancient Historians always had elements which were hard to believe and seemed more like flights of fantasy mixed with some facts. You always take it down with a pinch of salt. Herodotus wrote exactly this “ Another kind of Indians live in the neighbourhood of the town of Kaspatyros, and the land of of Paktyika (present day Paktia Province in Afghanistan) away towards the North from the rest of the Indians, their way of living is about the same as that of the Bactrians. These are the most warlike of all the Indians, and it is they who are sent for Gold; for in the this district there is the sandy desert. In this desert and this sand there are Ants which are smaller than Dogs but larger than Foxes for some which were caught are now in the possession of the King of Persia. These Ants make for themselves burrows below the Ground, and in doing so throw up the Earth, as ants do with us, and in the same manner they look exactly like ours. This thrown up sand contains the Gold and for the sake of this sand the Indians are sent into the desert…….” He also wrote this “ When the Indians arrive at the place of the Gold dust to fill their bags, they fill quickly and ride away as soon as possible. For the Ants, which, as the Persians would tell, have found out what has happened through their sense of smell, are at once after them and they are exceedingly swift. Thus if the Indians do not gain a good start before the ants have gathered, none of them would be able to escape…..”. Even Megasthenes , the Greek Ambassador at the court of , relates a similar story of Gold digging ants who dig not for the Gold but for making their burrows. The Gold he says was incidental. Infact those of you who have read History of Western Tibet / Dardistan written by Westerners will know that this Legend of Gold digging Ants is described by every single one of them.This is the starting reference point for the History of this region from a Western perspective. But it was not only the Greek / Roman historians who alluded to this legend. There was a reference to this ‘Ant Gold” in the Puranas and the Mahabharata. It is said that a Northern tribe, called the Khasas, bought Paipilika Gold (Paipilika is Sanskrit for Ant) as a tribute to Yudhishtir. Of course it's common knowledge that the Himalayas are rich in mineral deposits and that includes Gold as well. Gold was found under the ground as well as long the streams as fine dust. Cunningham describes how Gold sifting in the Indus and the Shyok River was done by Muslim Baltis as the Ladakhi Buddhists were forbidden from doing so as they were expected to work in the fields. Through most of History other Historians took this Giant Gold Digging Ants theory as a figment of Herodotus’;s exaggeration and adding a adding a dose of fantastic to his historical records. Many of them them even decried him as a liar and a fancy story teller. So was Herodotus was entirely wrong and this was just a yarn he had spun ? Not exactly as it was proven by a Gentlemen who took upon himself to solve this Great Mystery of the Giant Gold Digging Ants. The Gentleman was a French ethnologist Michel Peissel wrote a book named, “The Ants’ Gold: The Discovery of the Greek El Dorado in the Himalayas” in 1984. And he mentioned that the area described inhabited by these creatures was actually the Deosai Plateau in Baltistan. And the creature which was being alluded to were not Ants but the Long Tailed Golden Marmot and the Himalayan Marmot (These are two different species but both are found in the Himalayas). The Long Tailed Golden is more of a species found in Central Asia and the Hindu Kush, Pamirs and the Tian Shans though some are found in the Himalayas as well. A Golden Marmot which digs for Gold sounds just about right actually. We are all aware that Marmots live underground and for the same they dig deep burrows and have a maze of interconnecting burrows underground. All this burrowing entails that they throw up a lot of earth. And the Deosai Plateau is said to be rich in Gold Dust deposits. The Marmots dug up the earth and included in this were fine Gold dust particles that were then taken by humans. But which humans was the question again. Peissel claimed to have interviewed groups of people from Tribes living on the Deosai ie the Minaro, Maruts or Sonival tribes and apparently they confirmed this method of collection of Gold. And I have also been told Stories by people in the Kargil area about how the Marmots supposedly pile up Gold inside their burrows. So something is starting to make sense. It was the Long Tailed Golden Marmot or the Himalayan Marmot which fits the description and Herodotus is proven to be partially correct. But how did he confuse the Marmots with the Ants ? Peissel has an explanation for this last piece of the puzzle as well. Apparently the Persian word for “Marmot” and “Mountain Ants” is very similar so somewhere along the line the word which was meant to mean Marmot was taken as Ant and the legend of the Giant Gold Digging Ants took birth. To be fair to Herodotus he had never mentioned that he saw one of these Ants. And the creatures kept by the King of Persia (the most powerful sovereign in the World at that time ) were just that Marmots. Just one last part about the ferociousness of the Gold digging Ants described by Herodotus. Many of us regularly come across Himalayan Marmots while visiting Ladakh and there is a lot of Human and Marmot interaction (totally uncalled for and something to be discouraged) and they mostly come across as gentle Creatures. Maybe back in the days when they were much less habituated to humans they would react differently. Long Tailed Golden Marmots are however much more rarer. I remember coming across a Long Tailed Golden Marmot somewhere in the Muskoh area, which actually lies at the edge of Deosai, and that guy wasn't exactly pleased to see us. We of course kept our distance though the Marmot wasn't aggressive. Maybe if we would have gone closer he could have shown aggression. Can't really guess. Or maybe this story of the “ferociousness” of the creatures was invented by the same people who harvested the Marmot Gold but wanted to discourage anyone else from coming and claiming a right on their Gold. In those times people could believe anything. Whatever was the reason it surely kept people away and the mystery took well over two thousand years to get solved. So the next time you come across a Himalayan Marmot or better still a Long Tailed Golden Marmot do try and think of the Legend of Herodotus’s Fox Sized Ants. Pic from April 2018. 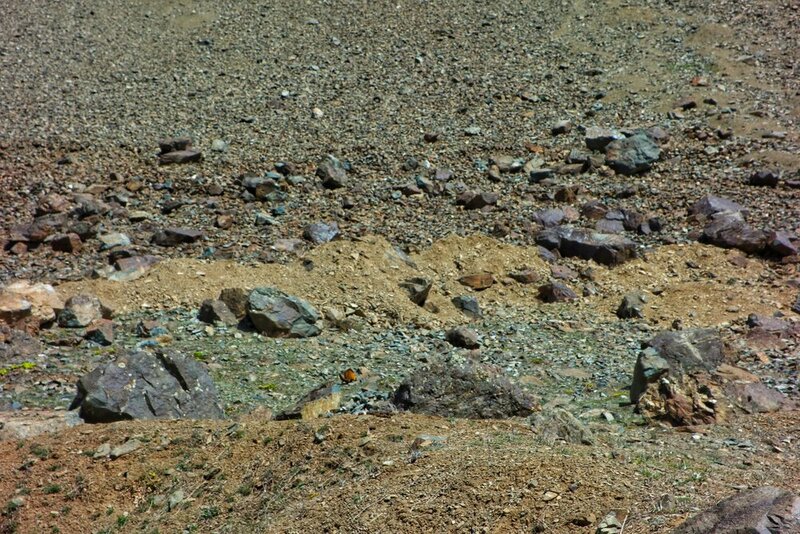 A Long Tailed Golden Marmot on the go, Muskoh Valley, Drass, Ladakh.